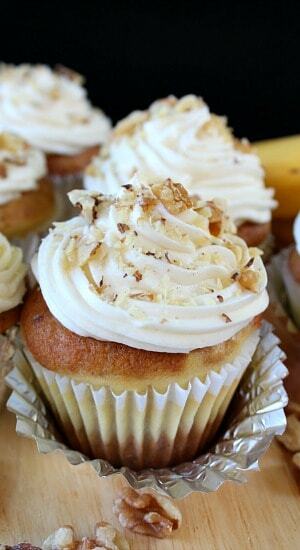 I have yet to meet one person who doesn’t love banana, so I decided to switch it up a little bit and make these banana nut cream cheese cupcakes more fun. 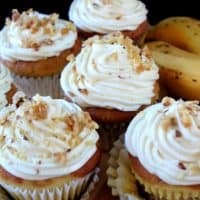 I’ve added a cream cheese filling to the recipe to make these banana nut cream cheese cupcakes creamier and offer a different taste rather then the normal banana cupcakes. 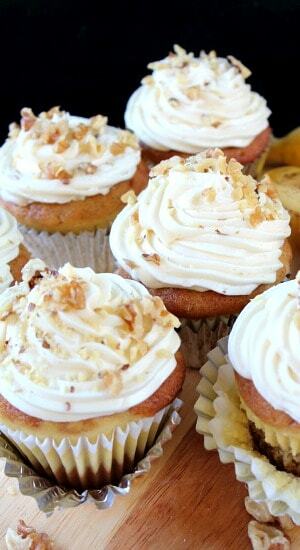 With the addition of the cream cheese makes these cupcakes even more irresistible. On top, I piled high some cream cheese frosting, and added a sprinkle of walnuts for the finishing touch. This I promise you, you won’t be able to eat just one! We always have bananas sitting on our counter top, and many times we just don’t get to them before they are too ripe. 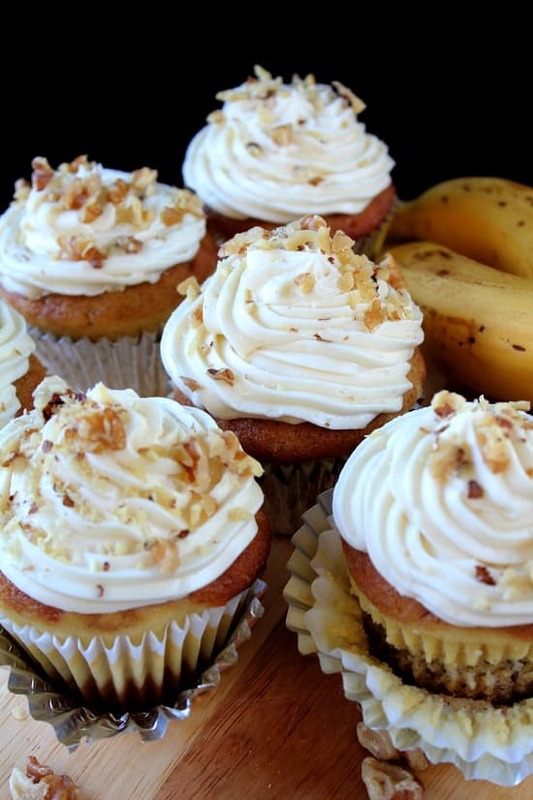 So, before you throw out those overly ripe bananas, bake up some of these delicious cupcakes. Take eggs out of the fridge and let stand at room temperature for 30 minutes. Grease and flour cupcake tins or use cupcake liners. Mix cream cheese, flour, sugar, vanilla and egg in a medium mixing bowl until well blended, set aside. In a large mixing bowl, whisk flour, sugar, baking powder, baking soda, and salt. Add bananas, buttermilk, butter, and vanilla and beat until well combined. Beat in eggs on medium speed until well blended. Pour into cupcake tins or cupcake liners and fill 1/4 full. Spoon 1 tbsp of cream cheese filling on top of batter. Pour remaining batter on top of cream cheese filling, to 3/4 full. Bake at 350° for approximately 17-24 minutes (depending on the size cupcakes you are baking), until a toothpick inserted in the middle comes out clean. In a medium bowl, beat cream cheese, butter and vanilla until well blended. Add powdered sugar 2 cups at a time and blend, repeat. Add milk and continue to beat until well blended. 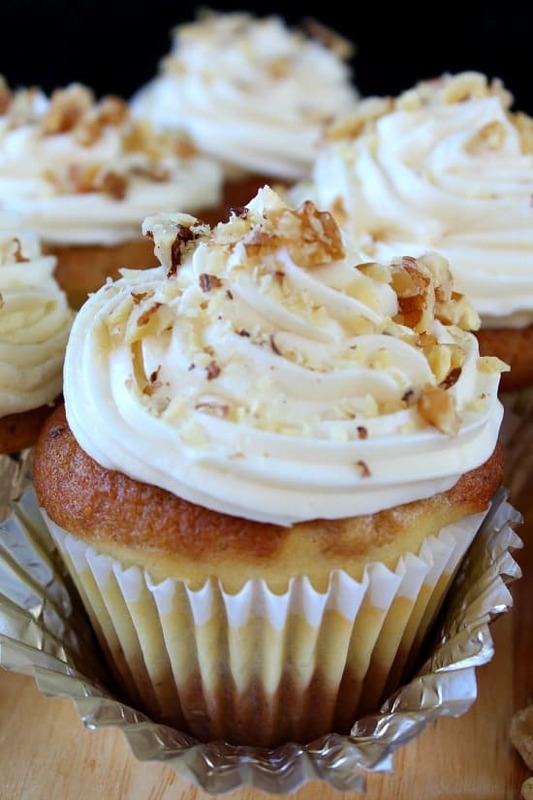 Frost cooled cupcakes and garnish with chopped walnuts. Hello, I am trying your cupcakes for the first time ever! & well right now they are baking but i noticed that the filling took over of the top part with the rest of the banana batter.. is that normal? I hope so! I can’t wait for them to be done.